Stop vacationing their way. Start vacationing your way ! For a true piece of island style life, Casa Mariposa offers a group of friends or family that once in a lifetime vacation home at extraordinary prices. Situated in the ex pat community of First Bight a mere 25 minutes from Roatan’s International Airport and just about mid island. Casa Mariposa has everything that you’ll need for an idyllic island vacation. Built from local lumber in a traditional island style, it has all the comforts of home with that Caribbean twist. It sits in landscaped tropical gardens full of colorful Hibiscus and Bougainvillea . You’ll find a well planned and beautifully equipped tropical home . The 1st floor consists of 2 air conditioned bedrooms ,Full Kitchen , full bath, living room and double doors lead to the expansive deck for ‘al fresco’ dining or a shady spot to watch the humming birds and kick back with an evening cocktail. The Upper Floor is where the Master Bedroom is located. 2 Queen size beds ,private bathroom ,sitting area and furnished deck with Hammocks and locally crafted Mahogany loungers. The ground floor of the house is where your Gas Grill, Washer and Dryer and Kayaks are located. TV and WiFi internet are provided . Llocal cell phone included for use during your stay just in case you should need to contact our Property Managers (who live within 10 minutes of the house) for any information or assistance. The house also has a full battery back up system charged by solar and wind so your fun will not be interrupted by any power outages. Just steps away are the crystal clear azure waters of the Caribbean, with the best snorkeling and shore diving practically on your doorstep – there are at least 4 dive shops within easy reach of the house and the area is well known for offering some of the best dive sites on the island. Interested in Golf? The Black Pearl Golf Course is an easy 15 minute drive from the house and our Property Managers can pre book Tee times prior to your arrival. Prices include Club, Cart and Caddy too! Why not try the most radical and extreme Zipline on the island – Pirates of the Caribbean is a little more than 5 minutes away and will allow you to see the island whilst swaying through the Canopy! Come and be our guests for a while – we think you’ll be impressed! We just returned from a week’s stay at Casa Mariposa and are ready to go back! The house is great and located in a wonderful setting. We were looking to enjoy the island but also wanted to be able to avoid the resort/cruise ship crowds. This property was perfect for such a trip. One of the few downsides is that the property is not on the water; but fortunately for us the property across the way was unoccupied during our stay so we were able to use the beach area. Without access to the beach the stay would have been slightly less enjoyable but not overly so. The snorkeling in the Bight is wonderful and we enjoyed paddling in the provided inflatable kayak. I wish I were back lounging in the hammock right now! I can’t say enough about how helpful caretakers Kevin and Claire were throughout the process. All of our pre-trip questions were answered in thorough and timely fashion. We were met at the airport and given a tour with great advice regarding groceries, restaurants, and activities. All of which proved accurate and useful. Five stars for customer service! The island is amazing and we enjoyed spectacular diving, snorkeling, ziplining, a hike through the botanical gardens in Sandy Bay, a tour around the interesting community of Oakridge, and some very refreshing lounging in the hammocks on the decks of Casa Mariposa. Very happy with our experience at this property and on the island in general. This past Christmas season my wife and I, who normally backpack and are quite adventurous, went with my parents to Roatan. My parents have not traveled alot and are a bit on the conservative side and preferred accommodations that were safe, clean, private, and well supported. Casa Mariposa suited all of our needs. We were off the beaten path, outside of the tourist areas, steps away from some of the best snorkeling we've done, and yet Claire and Kevin (the property managers) made sure that we were well taken care of and supported. They helped us arrange for a great rental vehicle, took us to the local market to get groceries that we cooked up in the Casa's full kitchen w/ BBQ, and were always available via cell phone to answer any questions we may have had. The Casa Mariposa was also at a great location to be able to access the entire island without a great deal of driving. The First Bight community also felt very safe. Great for the adventurer, the family, and anyone who would just like to get away and relax. The Casa was beautiful. I'll miss the naps on the hammocks and the dinners on the dining room on the deck. Thanks Kevin and Claire! My husband and I just returned from our week long stay at Casa Mariposa and we thoroughly enjoyed it. The house is set back on a private road and the driveway is lined with beautiful trees, flowers and plants..very inviting! The home was exceptionally clean and we enjoy cooking so we especially liked that the kitchen was well stocked with plenty of cooking utensils, pots, pans etc. There is plenty of living space both inside and outside. There always seemed to be a nice breeze so we rarely needed the A/C. We enjoyed the privacy of the little beach right across the road where we snorkled and sun bathed daily as well as watching glorious sun sets. The coral reef was amazing and we even saw a spotted eagle ray while snorkeling. The owners have also supplied kayaks for their guests and we traveled around the "bite" exploring the sights with them. There is a little dock down the road that gave us easy access to both kayaking and snorkeling. We used the upper decks for our daily excercise and for those who like to jog, the road to the main street was a great work out with it's hills and valleys! We would highly recommend this property for those who want to get away from the "rat race". Casa Mariposa was the perfect house for our group of six. There was plenty of room to enjoy the beautiful weather from the decks - both upstairs and down. We had the chance to use the hammocks, do some group yoga together on the top floor, and grill out with the stove. Both hummingbirds and fruit bats visited us each day and night, respectively, because we kept a fresh supply of sugar water going and maintained it each day. A hummingbird even landed on my finger after a patient wait right in front of the deck door! We enjoyed cooking in the kitchen and were able to clean our clothes in the washer. The snorkeling was also amazing and so readily accessible! In no more than a two minute walk we were able to throw some fins and a mask on and see some incredible fish - lionfish, sharksucker, four-eyed angelfish, trumpetfish, and blue tangs are just a few of the dozens of fish we were able to identify. Thank you for the wonderful experience and attention. 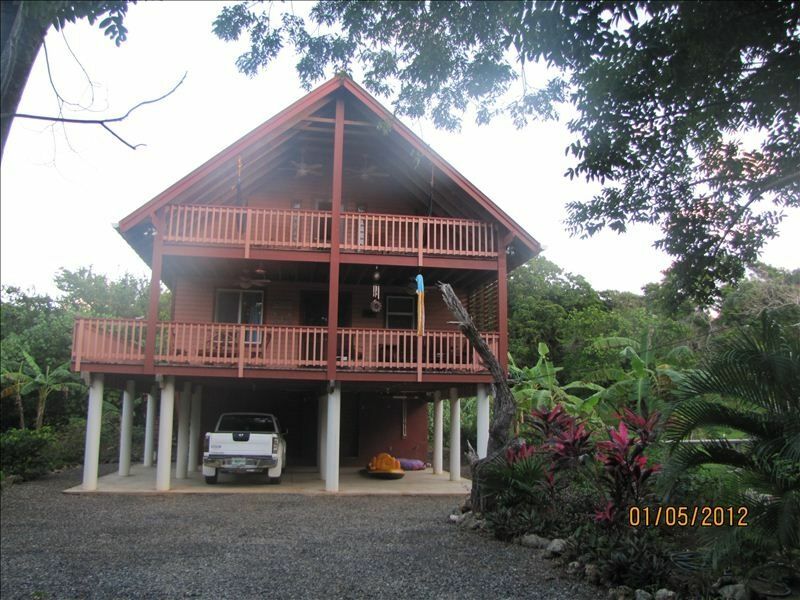 I wouldn't hesitate to recommend the Butterfly House to a friend or anyone looking for a great place to stay in Roatan! On behalf of the Clarion SCUBA Club, I would like to personally say that our stay at Casa Mariposa was fantastic! In total there was 7 of us and we all fit perfectly in the house. It was never cramped, over crowded, or too hot. We made use of the AC during the day, but at night the sea breeze was just right. SCUBA diving twice a day, sometimes three times a day, was extremely affordable through Paradise Island diving, not more than 10 minutes away, and snorkeling around our beach was magnificent! We are going to plan a yearly trip and continue to stay with Casa Mariposa. The diving was wonderful and we even had a student complete her certification on the island. Eating meals at home and out around town were all affordable and delicious, the local cuisine has something for everybody. Thank you so much for opening your doors for our club and we had a great stay!